The Notebook is a book that is written for people with imaginative mind in regard to love and long-lasting relationship. Language of the book is simple and mostly boring through the pages whether narrated by the author/ first speaker/ main antagonist or the dialogues between the characters. I have faced major difficulties coping with the slow paced events and creating an atmosphere to project the novel within my mind. The description of the places, emotions, events and characters used by the author is so simple and shallow that I was unable to live with the characters, feel what they feel, do what they do, travel to wherever they go, make love as they do or, even worse, I got fed up with the tedious conversations and the aimless sentences. My above description could be exaggerated for some and not acceptable for others, but what I know for a fact that this book has made no impression on me whatsoever despite the fact that I had watched the movie prior to reading the novel, and I am certain that the movie was not as bad as the book. This is my first experience in finding an adapted screen-write movie better than the original book. 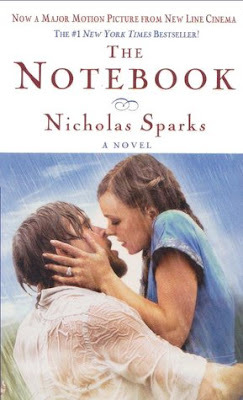 The Notebook presented a story that has its own fans. It is for the type of people who long for such kind of stories that could be true in some ways in accordance with their fantasies or they are simply curious enough to read them. I would give it only 1 star out of 5 because of all the aforementioned and the fact that I am now convinced that I am not interested in reading love stories anymore.